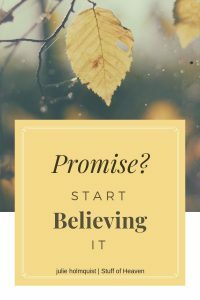 How Do We See God’s Promises? God promised Abraham that He would have a son and subsequently many descendants after that. He promised him he would become the father of many nations. “Look up at the sky and count the stars—if indeed you can count them. … So shall your offspring be” (Genesis 15:5, NIV). God also promised Abraham a good land (Canaan). “Look around from where you are, to the north and south, to the east and west. All the land that you see I will give to you and your offspring forever. … Go, walk through the length and breadth of the land, for I am giving it to you” (Genesis 13:14-17, NIV). With each promise, God asked Abraham to LOOK at the promise instead of his current reality. He wanted Abraham to SEE the promises with spiritual eyes — the eyes of faith. Faith doesn’t look at our current situation or what our earthly experience tells us. “Faith is the substance of things hoped for, the evidence of things not seen” (Hebrews 11:1, NIV). “So we fix our eyes not on what is seen, but on what is unseen since what is seen is temporary, but what is unseen is eternal” (2 Corinthians 4:18, NIV). “We walk by faith and not by sight” (2 Corinthians 5:7, ESV). 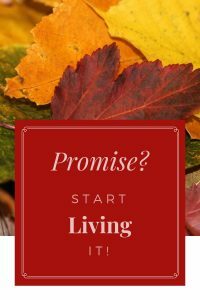 I don’t want to be one that stumbles at the promises God has made me. I don’t want to be double-minded and tossed around based on what I see in the natural. I want to fix my eyes on Jesus, the author and perfecter of my faith, don’t you? Have you been given a promise that God would restore your marriage? God restores marriages. Keep your eyes fixed on the truth of God’s Word. God is for your marriage. Instead of looking at all that’s wrong with your marriage, look to the One Who knows how to make all things beautiful in its time. Start thanking Him for it. Is healing a promise God’s given you? I have a pain in my hip that is a constant companion. I’m asking God for healing. The Word tells me that by His stripes I am healed. It’s not a pie-in-the-sky wish. It is the truth of God’s Word. Sometimes healing happens instantaneously. Sometimes it happens years from now. Ultimately, God heals, but sometimes God uses a physician to help heal our bodies. Other times healing doesn’t happen until we get to heaven, but that does not negate the healing power of God in our lives. Remember: We live in the now and the not yet! Did you know God has given you a promise of purpose? Ask God what that purpose is. Start moving in that direction. We should step out in faith and do what we feel He’s called us to do. He’s a big enough God to do a course correction if need be. But I just know He smiles when His children bravely act upon what they heard versus cowering in fear of failure. It says that “we can make our plans, but the LORD determines our steps” (Proverbs 16:9, NLT). Pursue that promise of purpose with everything you’ve got. But acknowledge God in all your ways. He will direct you. He will determine your steps. He will let you know which way you should go. I feel called to write and speak. I have had many people recognize a teaching gift God has given me. Do I feel like I am completely walking in that calling? No. But I am not sitting at home hoping one day God will make it all happen overnight. He has asked me to step out in faith and walk through the doors He’s opened for me. Get your eyes off your circumstances. They will pull you down every time. Instead, look at what at the promise. Keep your eyes fixed on Jesus, the One Who calls you to get out of the boat and walk on water. Unbelief will keep you stuck, and it will eventually harden your heart. Ask God to soften your heart and to receive the promises He’s given. 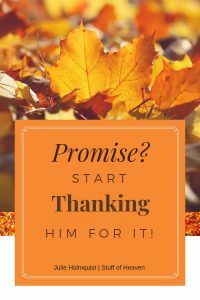 Ask Him to help protect those promises until they germinate and produce fruit.